Home Modules Module 2 Section 3 Who Might Be Seen by a Medical Geneticist? Medical geneticists are physicians who, after finishing their medical degree, receive specialist training in genetics through one or more of the following: the Canadian College of Medical Geneticists, Collège des médecins du Québec, or Royal College of Physicians and Surgeons of Canada. Medical geneticists assess, diagnose, and counsel individuals and their families who may have a genetic condition. Many medical geneticists provide direct care to children and adults with genetic conditions. Although most genetic conditions do not have a definitive treatment, such options are expanding greatly over time. 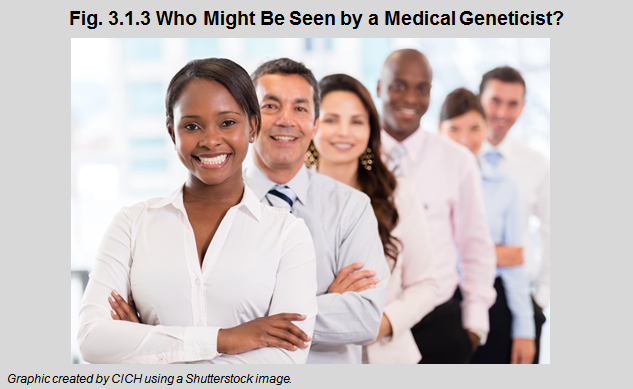 Who might be seen by a medical geneticist?• Individuals with a known or suspected genetic condition. • Family members of those with a known or suspected genetic condition. • Children with different facial or body features, congenital anomalies, developmental challenges, learning difficulties, or a combination of these conditions. • Individuals with a family history of cancer, such as breast or bowel cancer. • Couples with a history of recurrent miscarriages. • Couples or families following the death of a child from a known or suspected genetic condition. • Couples for whom an abnormality with potential genetic implications has been detected during one or more pregnancies.